HIGH CAPACITY&LONG LIFE: This battery pack built-in 4000mAh High Quality Lithium polymer rechargeable battery which is safety. Also,there is a raised bezel which will protect the phone screen from scratches when the phone face down to the table. SUPPORT LIGHTING EARPHONE: Listening to music and making call.Built-in metal plate, firmly sticks to magnetic car mount. 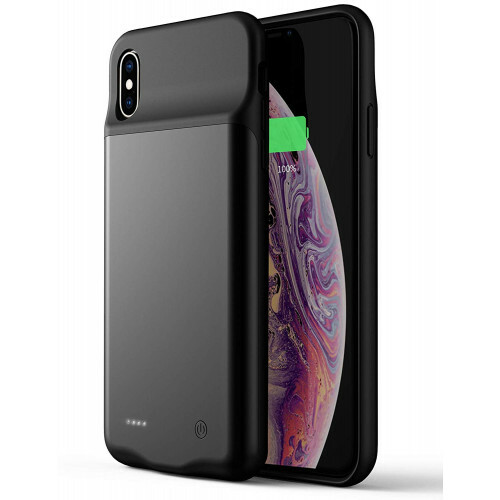 PERFECT FIT:This backup battery compatible with iPhone Xs Max.There are LED indicator lights on the back to check charging status and how much power left. 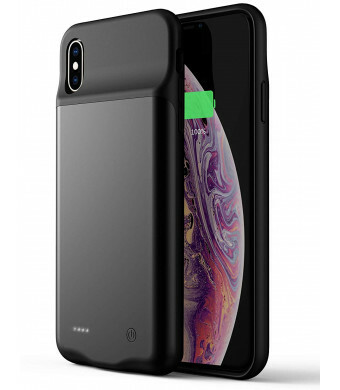 WEIGHT LIGHT AND THIN:Only adding 0.12 inch thickness and 4.3 oz weight to your iPhone Xs Max,thinner designed with no excessive bulk on the bottom,excellent protection,soft silicone frame protect the lighting port from damage,get it in hand more comfortable. 100% SATISFACTION GUARANTEED: Purchase with confidence! Lifetime warranty ensures you are protected for the life of this product and a 30 day money back guarantee offers peace of mind, enabling you to return the charge pack in case you dont like your purchase for any reason. 2.How many times can it charge? 3.Is the charging port a lighting one or a micro USB one? 4.Does the case have a magnet inside if it so it can hold on to any metal object? It has a metal plate built in to allow it to attract to magnets. 5.Can you use this with the magnetic phone holders for the car? 6. Does the battery case provide protection on face screen? Yes, it has a raised bezel to protect the screen when the phone face down. But also strong suggest to stick an clear screen protector on face screen. 7.Can I bring the battery case on plane? Please charge the battery case fully and deplete the power of the battery case completely at the first use. Dont break or dismantle the battery case. Dont throw it into the fire. And dont place it in the hot or humid place. Warranty: Offers a 1-year manufacturer limited warranty that will protect you against all defects in material and workmanship.Please contact us freely if you have any questions about our products,your query will be replied within 10 hours.